Michael Avenatti, the lawyer representing adult film star Stormy Daniels, said in an interview Thursday that he is "exploring a run for the presidency of the United States." Avenatti is visiting Iowa this week and is scheduled to speak at the Democratic Wing Ding fundraiser Friday night. Potential presidential candidates often appear at the dinner to gauge support for a possible run. However, some Democrats in Iowa aren't happy about Avenatti's interest in a presidential bid. 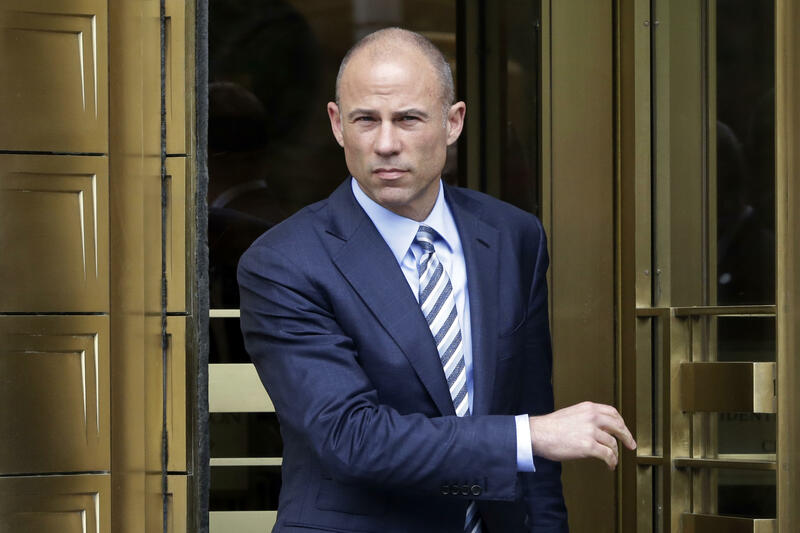 "I would never think to come to Iowa in order to use the state or the people of the state to raise my profile," Avenatti, 47, told The Des Moines Register Thursday. "And obviously if I do this, then I intend to work hard and I know that ultimately the trust of the citizens of Iowa is going to have to be earned." Avenatti has entertained the possibility of running for president before, tweeting in July that he would mount a bid against President Trump "only if I think that there is no other candidate in the race that has a REAL chance at beating him." "I think there's a huge appetite within the party for a fighter," he said. "I think the party has yearned for a fighter — a fighter for good, if you will — for a significant period of time. And for many, I'm probably seen as that individual." Avenatti's apparent presidential ambitions and decision to attend the state party's annual Wing Ding Dinner caught many party activists off guard and is believed to have caused three statewide candidates to drop plans to attend, according to a party activist. "No one is happy about it," said one activist, who was granted anonymity to speak frankly about the situation in order to preserve his relationships with party leaders. "Hard to say we want to win over independents when we're schmoozing with tabloid stars." Democratic gubernatorial candidate Fred Hubbell, Attorney General Tom Miller and State Treasurer Michael L. Fitzgerald do not plan to attend the Wing Ding Dinner even though it is one of the state party's biggest fundraising events and draws activists from across the state. "They're all denying it but everyone in the state knows it's true," said the activist. A spokeswoman for Hubbell said that he "has a personal scheduling conflict" but that his wife, Charlotte, will appear on his behalf. She did not immediately respond to follow up questions about whether the decision had anything to do with Avenatti's attendance. An aide to Fitzgerald said that the treasurer has a long-scheduled flight early Saturday morning out of Des Moines and didn't want to have to make the roughly two-hour drive back from the dinner in tiny Clear Lake. Aides to Miller didn't immediately reply to requests for comment. Avenatti acknowledged that his cable news persona had likely caused people to dismiss him as a potential candidate in the interview with the Register. Avenatti also visited the Iowa State Fair on Thursday and was escorted by longtime Democratic operative Matt Paul, who previously advised Hillary Clinton's presidential bids. In an email, Paul confirmed he is assisting Avenatti, but added it's "similar to what I've done for others. Not a big deal." While this year is a statewide election year, the Wing Ding Dinner draws far more attention in the odd-numbered year before a presidential caucus. In addition to Avenatti, two already-declared 2020 presidential candidates are set to speak: Businessman Andrew Yang and Rep. John Delaney (D-Maryland). Delaney is a multimillionaire representing western Maryland who is retiring from Congress to focus on his presidential campaign. He is spending millions of dollars this year on behalf of Iowa Democrats and is on the verge of completing a 99-county tour of the state – a feat usually achieved only by statewide elected officials and a small crop of presidential candidates, who rarely win the caucus. Other speakers on Friday include Reps. Tim Ryan (D-Ohio) and Eric Swalwell (D-California), who are frequent visitors to Iowa. Despite representing a part of California's Bay Area, Swalwell is an Iowa native who has campaigned on behalf of local Democrats and makes no secret that he's thinking about a White House campaign. Ryan unsuccessfully challenged House Minority Leader Nancy Pelosi (D-Calif.) for her leadership slot in late 2016 and ever since has mulled challenging her again or possibly running for president. He is among a crop of Midwestern Democratic lawmakers who say the party needs to do a better job appealing to moderates and independent voters in order to rebuild the party's bench in rural states.